Using some of the gorgoeus My Minds Eye - Nostalgia ...some fab 2crafty chipboard pieces (Design Elements & Gears ) and a very versatile Lil' Red Rocket orange checkered button! To get the rustic, almost rusty look on the 2crafty chipboard scroll & the cog, I first painted them in Gesso...and then dabbed them with Mr Huey's Pumpkin Spice mist. With the Gesso on first, it kind of creates bits of resist with the mist...I love the effect! And there is the orange checkered Lil' Red Rocket button tucked into my cluster, along with a handmade calico flower, some Kaisercraft blooms & a few other bits n bobs from my stash. My Journaling & title about this old fence & fence post that found & enjoyed taking pics of in Tassie. You have until the end of the month to upload your entry to the August sketch folder in the Handmade by Suzanne gallery, which you can find HERE. There is an awesome $40 store voucher up for grabs that includes FREE postage! And all you have to do is enter....the winner is determined by random draw . So, you gotta be in it to win it....time to get scrapping! I just love all the punching and the gorgeous colours and embellies. LInda, this is fab. 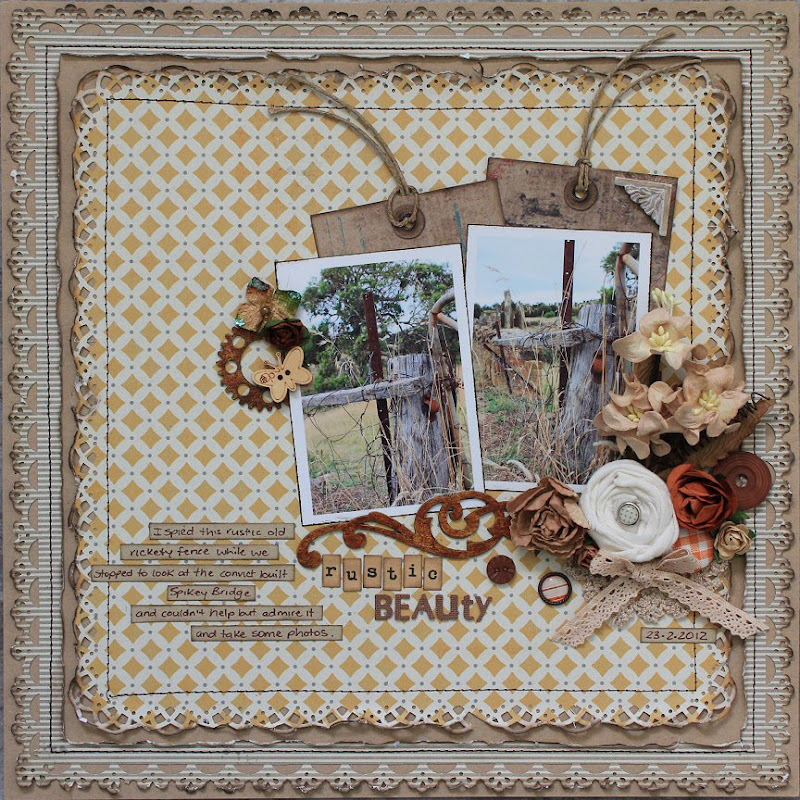 I love what you have done with the earthy tones..the gorgeous altering of the 2Crafty chippy, and the lace bow is so pretty! This one is most definitely needing to be published..just sayin'! Love this layout too!! you are on a roll!! Stunning! love the rusty chipboard! thanks for sharing the idea, Linda! Linda, I love this layout, the gorgeous earthy colours and rustic chipboard. Everything, so beautiful! WOW! What a beautiful layout. CHippie looks fantastic, photos always intrigue me on your blog, such a very different climate & terrain, and your colours are just so subtle and lovely!! Kraft it Up & Cosmo Cricket - Tea for Two!! !